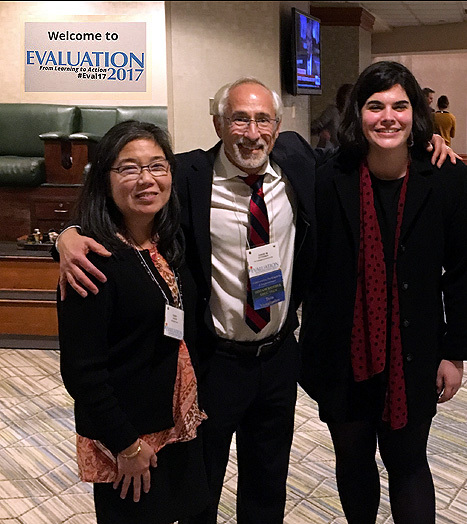 On November 10th Dr. Ruby Takushi, our Program Director, and Jane Brennan, our former Special Projects Coordinator, co-presented with Dr. David Fetterman from Standford University at the American Evaluation Association’s annual conference in Washington D.C. The presentation, Recovery Café (a Peer Support Center for People Traumatized by Homelessness, Addiction and other Mental Health Challenges) & Empowerment Evaluation: Value Alignment, Organizational Epiphany, and Methodological Sophistication, focused on Recovery Café’s measurement and evaluation process. Quantifying the outcomes of the healing work of Recovery Café, both qualitatively and quantitatively, has been an organizational priority for several years and we were thrilled that Recovery Café was selected to present at this conference. It is exciting to share some of our results of an intensive process to accurately represent that the Café’s model of holistic services offered in a milieu of radical hospitality works! We are grateful for the Technical Assistance provided by a grant from the Substance Abuse and Mental Health Services Administration.